So morally you have to weigh the immense good of saving a life against the possibility of disrespect for the dead. Honestly though , if your going down that road you would need to object o autopsies and voluntary medical cadaver donation as well. The problem is that by the time someone is certifiably and irreversibly dead most of their organs are not viable for transplant any longer. So begins the slippery slope, that needs to be addressed, and the reasons why I will never carry an organ donor card. 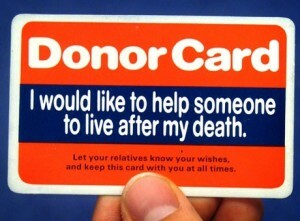 Looks like I may have to start caring an anti-organ donor card now as well.